Amazing hotel with kind staff. The outdoor pools were amazing and private. Rooms were clean and updated. Great location. Everyone in this town was so friendly! Where to find Grimisuat hotels near an airport? Where can I find hotels in Grimisuat that are near tourist attractions? When you're ready to plan your Valais dream vacation, you can relax because you will find plenty of quality hotel and apartment options in Grimisuat. 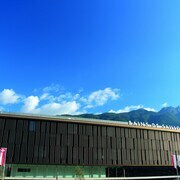 Our accommodation section has 21 hotels within a 0.1-kilometre (0.06-mile) radius of Grimisuat's center. 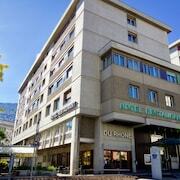 You will find Hôtel du Rhone and Hotel Castel within 3 kilometres (2 miles) of the center of Grimisuat. 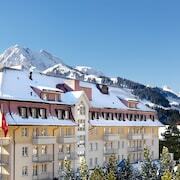 The The Alpina Gstaad is positioned 25 kilometres (16 miles) from the heart of Grimisuat. 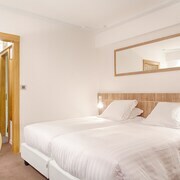 Or, alternatively, the LeCrans Hotel & Spa is situated 9 kilometres (6 miles) away. 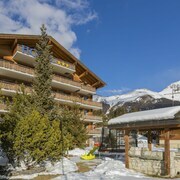 Some more hotel options around Grimisuat include the W Verbier and the Grand Hôtel du Golf & Palace. Looking for more things to do? Why not spend the day enjoying Leukerbad Ski Resort and Alpentherme Thermal Baths, which you'll find in Leukerbad, 25 kilometres (15 miles) to the northeast of Grimisuat. 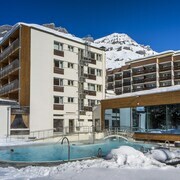 The Les Sources Des Alpes and Aparthotel dala are a few of the lodging options in Leukerbad. Alternatively, you could consider staying at Dorenaz, 25 kilometres (17 miles) to the southwest of Grimisuat, where you can pick from the Rêves Gourmands and Hotel Vatel. If you're staying in Dorenaz, a couple of sights worth adding to your itinerary are the Dorenaz-Allesse Cable Car and Téléphérique Dorénaz-Allesse. If you are into sports and love watching games you might choose to take a trip to Stade de Suisse Wankdorf, which is 80 kilometres (49 miles) to the north of Grimisuat. Those sports fans wishing to stay close to the stadium can make a choice from the Hotel Bellevue Palace or the Hotel Schweizerhof Bern. For those travelers arriving or departing through Belp Airport, you may plan to book accommodation at Apartments Justingerweg, or Hotel Sternen Muri, both of which are a short distance away. What are the most popular Grimisuat hotels? Are there hotels in other cities near Grimisuat? 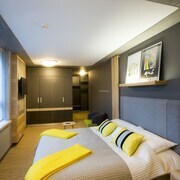 What other types of accommodations are available in Grimisuat? Explore Grimisuat with Expedia.ca’s Travel Guides to find the best flights, cars, holiday packages and more!